Summary: “What can happen on an innocent field trip to a museum? In the secure protection of a jail? OR on a simple bus ride? Plenty, if you are a member of the Pillage family and your name is Beck Phillips. No matter what strangeness is going on, Beck still manages to turn things on their head. Beck is later asked to do something by his sick father. Should he do it? Even though he knows what will happen, and it could risk his relationship with Kate, Beck is tempted. Mindy’s Review: 4 out of 5 stars. I really enjoyed this series. It’s a great ride! I love how the author writes Beck’s character. He’s a sarcastic little brat sometimes, but he always makes me smile. Beck always has something clever to say. He is written so well, each character is. There are some surprises with the dragon egg that I really liked, and a little twist too. I did want more from the dragon though, but it didn’t “ruin” the book for me. Very clever and creative series. Check out my earlier review of Pillage. 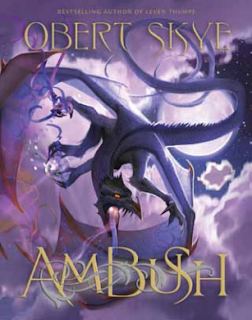 About the Author: Obert Skye read his first book at age two. He wrote his first story at age four. And he was nearly trampled by a herd of water buffalo at age six. For a short time, he lived on the Isle of Skye in Scotland, where he spent time as a candy-taster. Several years ago, Obert Skye says, he discovered the existence of Foo. Publishing his story as a fictional series was not Obert’s first choice. Nevertheless he is content that the “history” is being told. Hobbies and other interests: Collecting old maps, water polo, roller coasters. The Giveaway: Heather from Fire and Ice had the chance to meet Obert at his Deseret Book signing last week. So, we are giving away a swag pack of an author signed bookmark and postcard! Simply comment below to enter. Open internationally. Ends March 20, 2012.